David Goggins is a renowned American athlete with exceptional skills and remarkable strength which has fetched him many awards as an ultramarathon runner, ultra-distance cyclist, and triathlete. He attained worldwide fame as a one-time world record holder for the most pull-ups done in 24 hours. Following a successful career as a retired US Navy SEAL and one-time United States Air Force Tactical Air Control Party member, David Goggins has grown to become a notable motivational speaker and author. Read on as we unravel more facts about the multi-talented athlete’s bio and family life. The famous ultramarathoner was born In Buffalo, New York, on 17th February 1975 to Trunnis Goggins (father). He is of African-American ethnicity. At the age of 8, his parents got separated as a result of domestic violence in their home. Details about his mother, siblings, and education are not yet known. Goggins has been a role model to sportsmen and women all over the world, thanks to his strong passion to join the US Navy SEAL which went a long way to shape him. At that time, he was almost obese and got rejected at his first SEAL trial. As a result of his courage and determination, in less than three months he went on to shed his body weight and finally made it to the US Navy SEAL training. After graduating successfully from Basic Underwater Demolition/SEAL training with class 235 in 2001, the triathlete was later assigned to SEAL Team FIVE. He followed it up by graduating with distinction enlisted “Top Honor Man” from the Army Ranger School in 2004. Having a strong desire to help the children of the fallen special operations soldiers, David Goggins began to train himself for long distance running with the target of raising money to open a foundation that will give scholarships and grants to the fallen operations soldiers’ children. He called it the Special Operations Warrior Foundation and was able to raise in excess of $2 million after contesting in endurance challenges including the Badwater Ultramarathon that he participated three times. In 2005, the talented American athlete competed in San Diego One Day Ultramarathon held at Hospitality Point. He completed the 100 miles marathon within 19 hours despite only running a marathon once before in his career. Following his participation in the aforementioned event, Goggins also contested in the 2006 Badwater – 135 challenge, where he victoriously clinched the 5th overall winner in the world-class event, a rare result from an ultramarathon amateur. In the same year, Goggins further went on to participate in the Ultraman World Championships Triathlon in Hawaii. Meanwhile, prior to the championship training, the notable author had never ridden a bike before in any competition. Nevertheless, he did what he knew how to do best as he cycled 261 miles in two days, finishing second in the three-day, 320-mile race. Sometime later, the skillful athlete participated in extra 14 ultra-endurance races and as usual, he finished among the top five winners in nine of the racing competitions. David Goggins has had a low moment in his career having suffered from Asthma, Obesity and Congenital heart defect which was later corrected through surgery in 2010. Surprisingly, the never-say-die athlete didn’t give up as he had his dream come true by breaking the world record for the most pull-ups done within 24 hours in Brentwood, Tennessee, in 2013 and also setting a new world record for completing 4,030 pull-ups in 17 hours. The highly motivated athlete has participated in numerous sports events where he has imprinted his feet on the sand of time. In addition to being a former world record holder, David Goggins was given a reputable name “Hero of Running” by Runners World in 2008. As a motivational speaker, Goggins has written a book titled ‘Can’t Hurt Me: Master Your Mind and Defy the Odds’. The American athlete has managed to keep his personal relationship details private over the years, hence little is known about his love life. 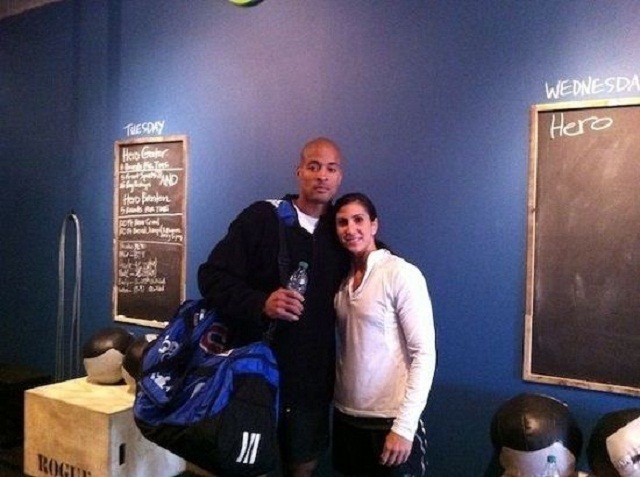 Well, it is known that David Goggins is a married man, and he is married to his lovely wife Aleeza Goggins. She is a professional nurse and also a pivotal member of his service staff. The couple tied the knot in 2010, in what was reported to be a secret wedding and information regarding their children are not public knowledge. However, the pair have been great companions for close to two decades. Regarding David Goggins’ parents, his father is Trunnis Goggins while his mother’s identity is yet unknown. According to the skillful athlete, his father was very abusive and domestically violent which made his mum to sign the divorce papers when he was 8 years old.